My baby boy is growing just too quickly and so I have been looking to add a few more pieces to his 3-6 and 6-9 months wardrobe. It's a good excuse to warrant some online window shopping and a wish list post! The chillier days are on there way and so its all about layers. From Next I have been eyeing up their rather cute dinosaur range including these gorgeous leggings and tops. As you may guess, I'm loving grey for Henry but the pistachio green top is such a lovely colour and a great alternative to the stereotypical blue. Next stop was Zara, I could buy everything from there but must refrain so close to Christmas!! I particularly like the grey coat, doggy sweater and brown joggers and of course a cloud hat (you all know I can't resist a cloud print!). All of them look cosy, but most of all comfy! I don't like to see particularly like to see babies in jeans and Zara stocks lots of lovely joggers and leggings for boys. Next would be a splurge, some rather cute Sheepskin Boots. I like to see babies in these rather sweet booties, keeping them nice and warm whilst out and about. I would love to get Darcie a pair like these too. Then to Gap, for this sweet bodysuit. My little Henry is certainly my little dude, plus its grey. A must combo! Lastly is a rather adorable snowsuit from Debenhams in a woodland print. All babies need a snowsuit as a part of their winter wardrobe! 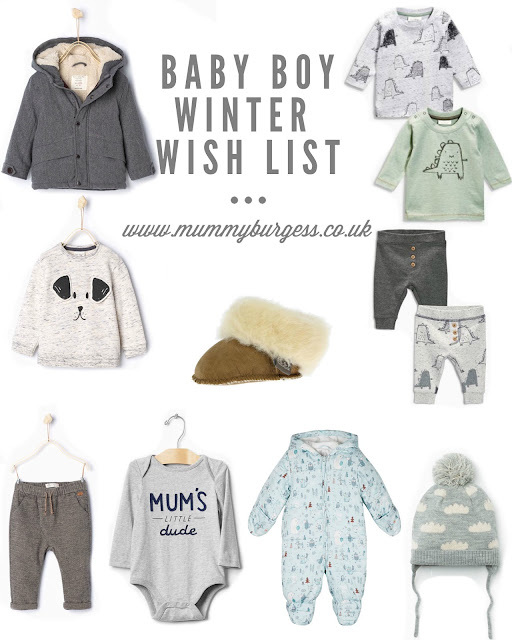 Have you been lusting over anything for your little ones?